Since 1934, we have strived to offer quality central vacuum cleaners Danvers MA area residents can rely on for years to come. Managed by a fourth-generation owner, North Shore Vacuum and Appliance continues to offer the quality customer service and expert product knowledge synonymous with our name - skills that have been passed down throughout the past several decades. Here, we offer machines that are built to last, and the knowledge that goes with them. Are you overwhelmed by the seemingly endless options we offer for central vacuum cleaners? We know, we have a lot. But that's one reason why our experts are here to help. 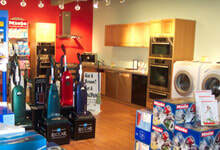 North Shore Vacuum and Appliance has built our reputation on knowledge, experience and customer satisfaction. As a leading dealer of all types and styles of central vacuum cleaners, we have something for everyone throughout the greater Danvers area, in the brands you love and at prices you can afford. When it comes to central vacuum cleaners, we offer expert installation and repair services, in addition to a variety of styles for sale. For help deciding which is the right product for you, or for more information on our central vacuum cleaners, Danvers MA area residents can call (978) 774-1155 today.